LOS ALAMITOS RACE COURSE, CYPRESS, CA….The 14th annual Los Alamitos Equine Sale enjoyed a tremendous closing session on Sunday to post an overall increase in gross sales of 20.6% and an overall increase in average yearling sale prices of 19.1% during the two-day event. A total of 255 horses were sold during the two days for a total of $5,702,200, up from the 228 horses sold for $4,729,500 in 2017. The average sale price for the 227 yearlings sold was $23,802, up from the 203 yearlings sold for an average of $19,980 last year. The overall average sale price was $22,362, up 7.8% from the $20,743 average in 2017. 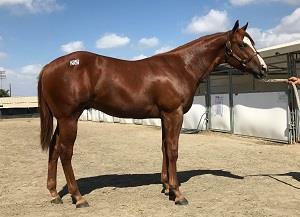 Hip 280 Requiring Fire, a filly by Walk Thru Fire out of No Tools Required, was purchased for the sale topping price of $190,000 by Donald Cavanaugh from the consignment of Vista Equine Colorado, LLC. She’s a full sister to the stakes winning Required Fire ($71,235) and a half sister to New Mexico HBA Stakes winner one Hot Mecanic ($158,557). No Tools Required ($116,509) won the Restricted Grade 2 TQHA Sires’ Cup Futurity and the Restricted Grade 3 TQHRA Sires’ Cup Derby. She also won the Grade 3 Rheudasil Handicap. Juniors Quarter Horses, Inc. purchased Hip 252 Made Over, a Favorite Cartel colt out of Make Over, for the sale’s second highest price of $112,000 from the Ed Allred consignment. He’s a half-brother to Grade 2 El Primero Del Ano Derby winner New Look ($256,517), and multiple Grade 1 stakes finalist Renewed ($179,037). Cavanaugh purchased Hip 247 Required Jess, a filly by Mr Jess Pery also out of No Tools Required, for $100,000 to make her the third highest seller of the weekend. 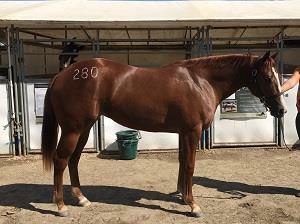 Consigned by Vista Equine Colorado, LLC., Required Jess is a half-sister to the sale topper Requiring Fire. There were a total of 18 horses purchased for over $50,000 on the second day of the sale. Other top selling yearlings on Sunday included Hip 315 Pesky, a colt by Favorite Cartel out of 2015 AQHA champion aged mare Quirky, who was purchased by Juniors Quarter Horses, Inc. for $96,000 from the Allred consignment; Hip 321 Forgot The Rose, a filly by Favorite Cartel out of Remember Me Rose, who was bought by Enrique Gonzalez of EG High Desert Farms for $95,000 from the consignment of Burns Ranch, Agent; and Hip 170 IBA Dreamer, a colt by Tres Seis out of First Down Dream, who was purchased by $90,000 by La Felix Montana Ranch LLC. from Lazy Creek Ranch Agent for Quarter K, Inc.
Donald Cavanaugh was the sales’ leading buyer after purchasing five yearlings for a total of $477,000. Alex Castaneda was the second leading buyer with 27 horses for $317,000, while La Feliz Montana Ranch LLC was third after buying four hips for $294,000. Burns Ranch, Agent finished as the leading consignor by gross sales with 61 head selling for $1,681,900. Ed Allred was the second leading consignor with 45 head selling for $970,700, while Vista Equine Colorado, LLC. Agent was the third leading consignor with 14 head selling for $629,700. Lazy E Ranch, LLC, Agent sold 15 head for $302,000 plus an additional 10 head for $301,000 as agent for John Andreini. 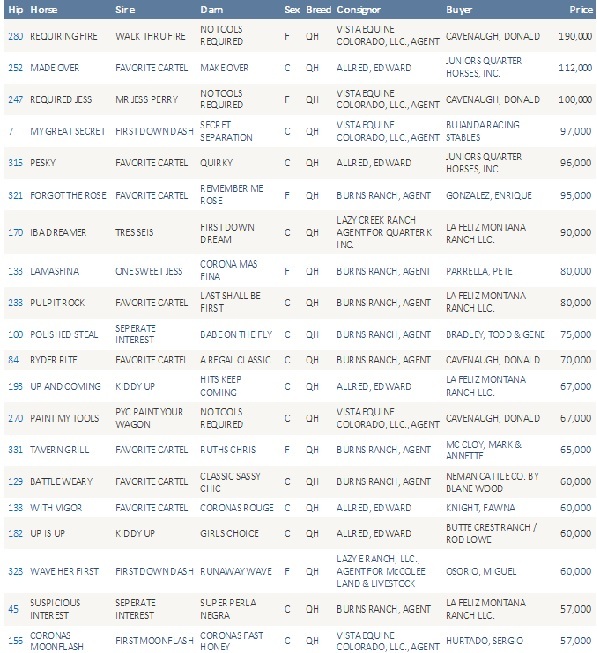 Lazy E Ranch also served as agent for five other consigners that finished in the top 20. For more info please call 714-236-1755. The Los Alamitos Equine Sale is a partnership of Edward C. Allred, John Andreini, Burns Ranch, Inc. & Double Bar S Ranch, LLC. For more information call PCQHRA at 714-236-1755. Since 1951, Los Alamitos has been the nation's premier Quarter Horse track and the home of four races worth over $1 million dollars, including Quarter Horse racing's only $2 million guaranteed race - the Los Alamitos Two Million Futurity. Los Alamitos' other million dollar races are the Golden State Million Futurity, the Ed Burke Million Futurity and the Los Alamitos Super Derby. Los Alamitos is also the home of the prestigious $750,000 Champion of Champions.